We’ve been having some trouble(s) with our Windows PC lately, and while I’m completely *capable* of diagnosing and fixing whatever the problem is, I just don’t have time to screw with it. I’ve got a house to finish, ASAP! But I couldn’t just ignore the problem, because the kids need a computer for quite a bit of their school work now. 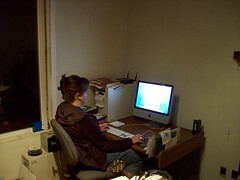 My wife suggested that we [get a Mac](http://www.apple.com/getamac/works.html). I’d been thinking the same thing for months (years? ), so I picked up a [20″ iMac](http://store.apple.com/1-800-MY-APPLE/WebObjects/AppleStore.woa/wa/RSLID?nnmm=browse&mco=7B723646&node=home/shop_mac/family/imac) the very next day. It took me less than 20 minutes to unbox the thing, set it up, create accounts for all four of us, and “verify that everything was working” (i.e. play with the new toy). 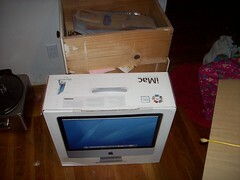 This entry was posted in Uncategorized and tagged imac, mac. Bookmark the permalink. Sweet!!!! New toy, new toy! Have they discovered the little camera just above the screen yet? Dude, it was the first thing they started playing with! Finally got around to upgrading the memory. Max’ed out at 4 GiB, woo hoo!